Note: Revival Market offers turkeys (brined and un-brined) as part of its holiday provisions to go menu. Click here to order by Friday Nov. 16. Few things elicit more opinions around the Thanksgiving table than how to prepare the holiday bird. Luckily we've got some experts on our team. From proper brining technique to achieving a deliciously crispy skin, Revival Market Chef de Cuisine Todd Patterson offers his instructions and tips for the perfect turkey. To begin, do not wash your turkey after you remove it from its plastic bag to season it; just pat it dry with paper towels. Any potential bacteria will cook off during roasting. Not stuffing or trussing allows the bird to cook quicker, with the white and dark meat finishing closer to the same time. If you do oil , but do not baste your turkey, you’ll get crispier skin without constantly opening the oven. Some people swear by basting, but every time you open the oven door to baste, you let the heat out. Basting also gives you a less crisp skin. Instead of basting, rub fat (butter, olive oil or coconut oil, for example) all over the bird just before you tuck it into the oven. Then leave it alone until it’s time to check for doneness. 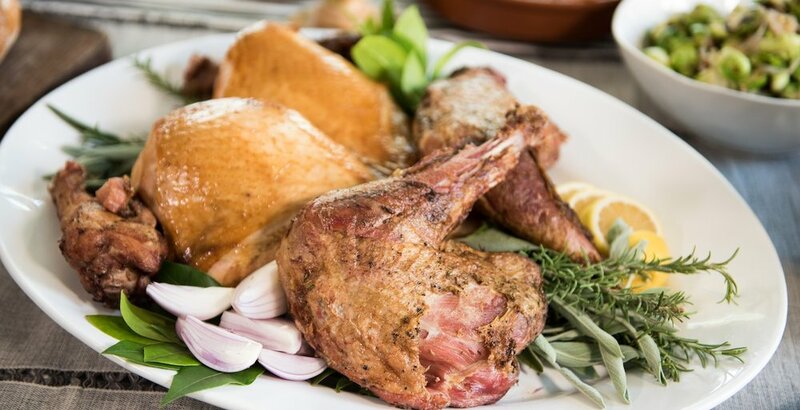 When you are ready to cook the turkey, remove it from the refrigerator and allow it to come to room temperature for one to two hours depending on size. IF NOT BRINING TURKEY: the bird should be liberally seasoned with salt at least one hour ahead of cooking OR up to one full day ahead. This will help season the meat fully and create a crispier skin. IF BRINING TURKEY: it will not require any additional salt and should simply be pat dry with paper towels and allowed to air dry at room temperature for best results. Place turkey, breast side up, on a roasting rack set inside the roasting pan. Transfer pan to the oven and roast 30 minutes. After 30 minutes cover breast with aluminum foil. Reduce oven temperature to 350 degrees and continue roasting until an instant-read thermometer inserted in the thickest part of a thigh reaches a temperature of 165 degrees, see chart for approximate cooking times. Transfer turkey to a cutting board to rest for at least 30 minutes before carving. THIS STEP IS VERY IMPORTANT FOR BEST RESULTS. To add flavor to both the turkey (and the gravy, if you’re using pan drippings), you’ll want to add aromatics to in the turkey cavity and at the bottom of the pan. Some combination of herbs, peeled garlic cloves, quartered onions and lemons, apples, mushrooms, celery, carrots and bay leaves can be used in both places. Then cover the bottom of the pan with a half inch of liquid (wine, cider, beer, broth, water) so the drippings don’t burn. Start taking the turkey’s temperature at least 15 minutes before you think it might be done. To check its temperature, insert an instant-read thermometer into the thickest part of the thigh and under the wing, making sure you don’t touch any bones. Your bird is done when its internal temperature reaches 165 degrees. Don’t be alarmed if the thigh meat near the bone still looks pink. Some turkeys are naturally pinker than others and a fully cooked bird will often have that color. Cooking times can vary greatly depending on size of turkey, oven efficiency, and temperature of the turkey when starting. Check for doneness with an instant read thermometer before the suggested times. Instructions from Todd Patterson, Chef de Cuisine at Revival Market.